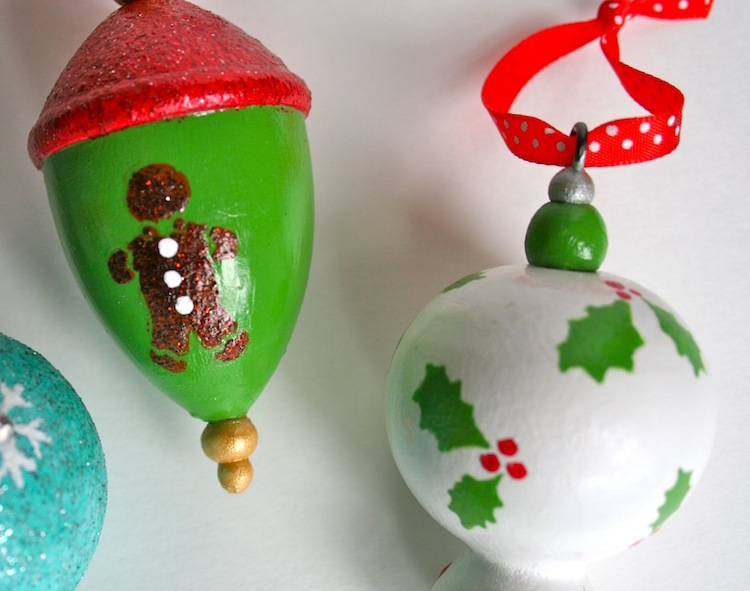 Grab some wooden ornaments – and your Martha Stewart stencils – to make these unique painted ornaments! They are easy to personalize and make great gifts. I've had some wooden ornaments purchased at Michaels laying around for about two years, and I am so excited to share with you that I *finally* got the chance to paint them. I think sometimes it just takes the right crafting supplies and everything coming together at the right time. 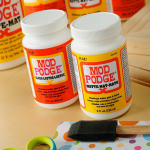 For this project, I used several supplies including goodies from the new Martha Stewart Decorative Paint Line from Plaid . . . I also used my favorite Mod Podge Dimensional Magic. There's a lot of glitter and bright colors goin' on, just like there should be for the holidays. These were so fun to make – I had a blast. Read on to find out how they were made. 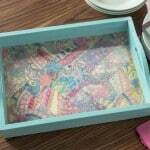 Martha Stewart Crafts Paint – this is a lot of colors; use as many or as few as you like. I was playing! The key to making everything look good with these paints is allowing appropriate dry time. This is the hardest for me because I am completely impatient in every way. I promise you won't regret it. I first decided on my paint color combinations and then went to town basecoating. Small paintbrushes will aid you in this step. Basecoat everything first and allow to dry. 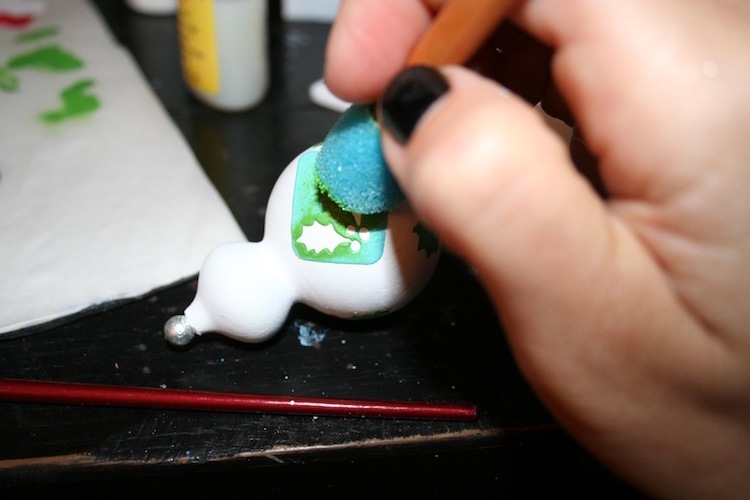 My little round guy was to get the Feldspar glitter paint over the Surf paint. I quickly realized that brushing was not the way to go with the glitter paint. Use the spouncer! 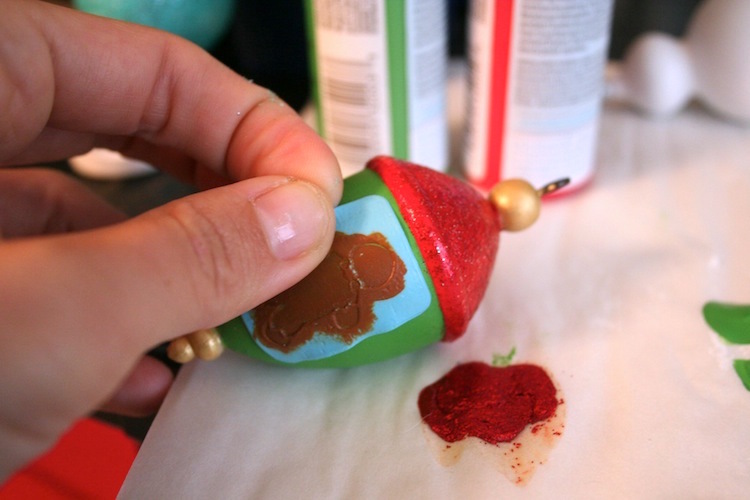 Give several coats of the glitter, until you have the desired glitter effect that you are looking for. I wanted it pretty glittery, so I painted on about five coats. 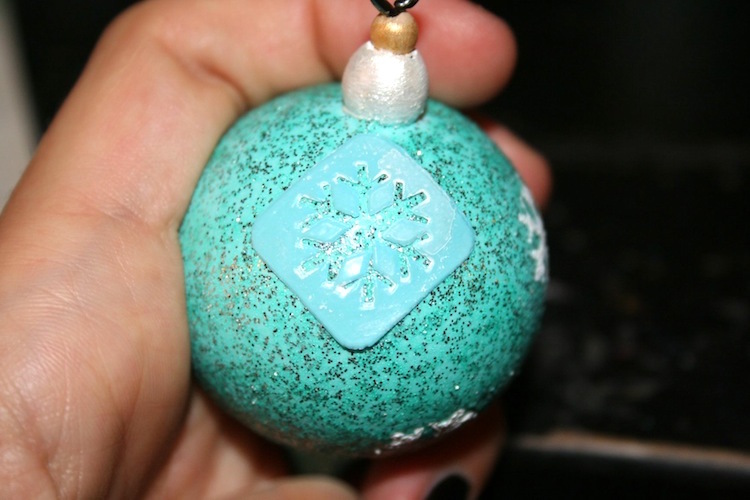 To finish this ornament, I added a few snowflakes using the adhesive stencil. This is where I learned patience. I painted on a snowflake (rub the stencil down firmly and then use a spouncer to paint), and then washed the stencil (and let it dry) before painting another. If you do this, you will get the cleanest lines. 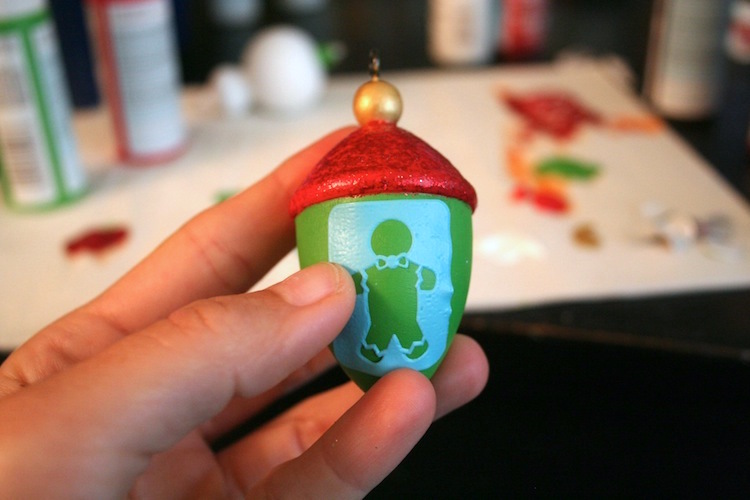 My acorn ornament got the gingerbread man stencil. Notice that I painted the top Habanero and added Garnet glitter paint to finish it off. 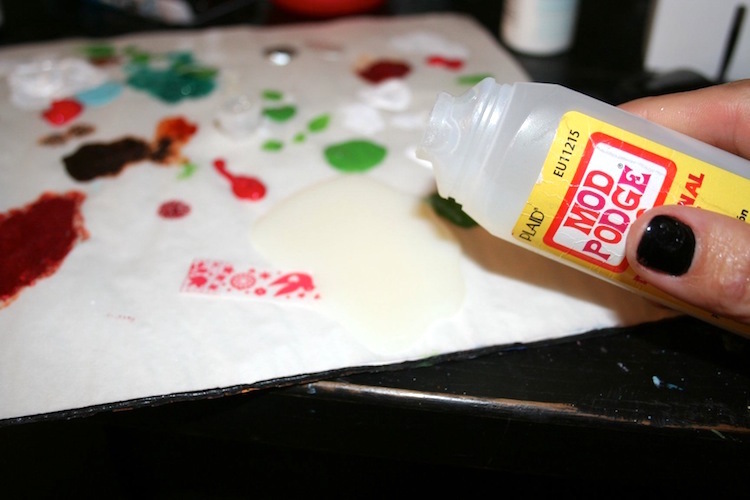 Peel off the stencils while the paint is still wet and touch up with a small paintbrush as needed. After painting the body with Chestnut Brown, I came back with the stencil again and added Brownstone glitter on top. I let everything dry and gave my little man some buttons with the end of a paintbrush. This teardrop was my most challenging wooden ornament. It's not that it was hard, but it did take some time to get so many holly onto it. 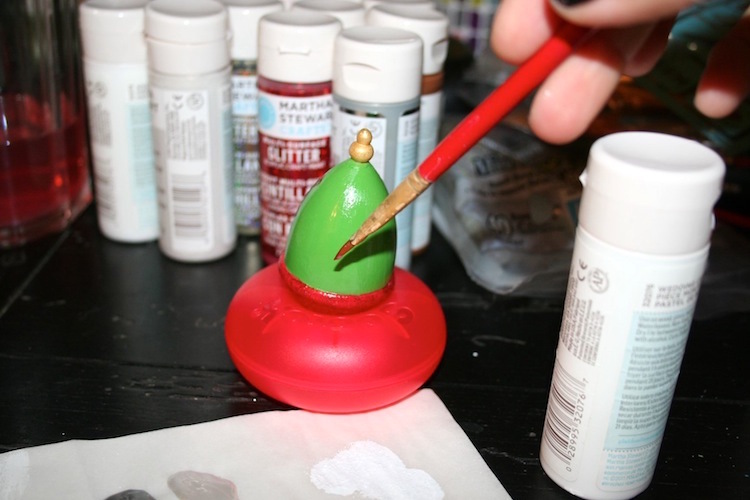 If you have several painted ornaments drying at once, it's not a big deal because the paint dries quickly. You can work on one and then move to another while everything is drying. I decided to add Dimensional Magic to two of the ornaments (gingerbread man and holly). Simply take the cap off and pour a little bit out onto your palette – or you can dump the whole bottle like I did, but I don't recommend it (whoops). Paint the Dimensional Magic on with a brush to get an epoxy-shiny-ish effect. Those new tape dispensers make great ornament drying holders! Make sure to get your brush right into water after using DM, because if it dries you'll have to throw away the brush. Allow everything to dry thoroughly. 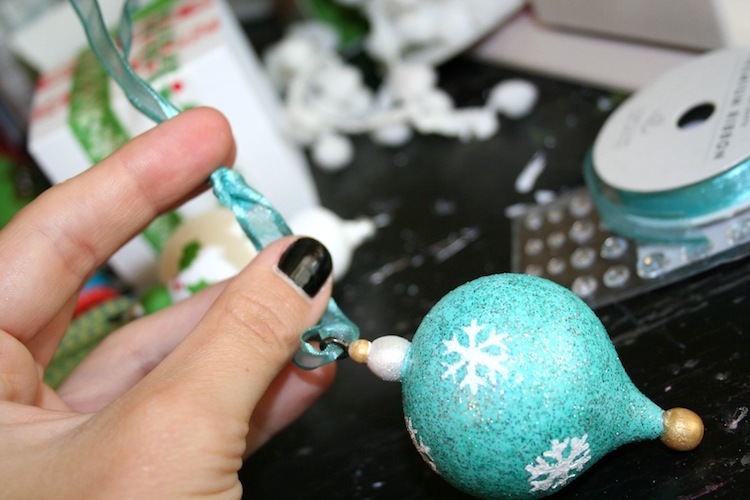 Add the finishing touches to your painted ornaments, like ribbon hangers and rhinestones with craft glue. 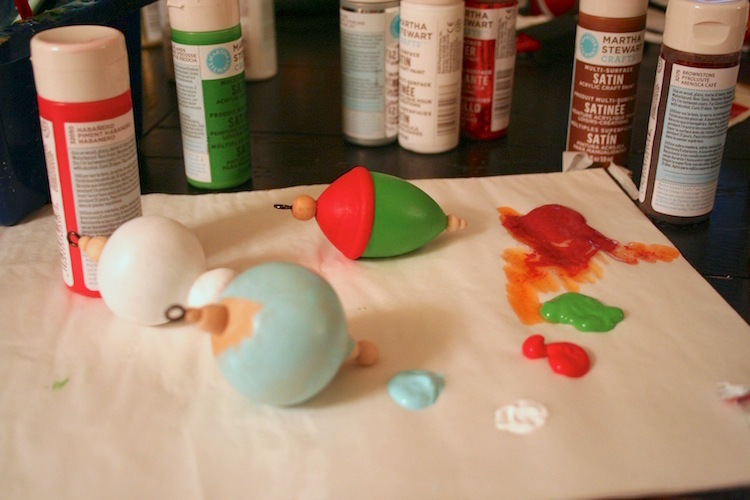 I couldn't be more pleased with my painted ornaments! 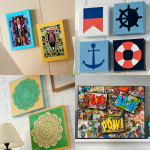 I love the Martha Stewart paints (and I mean love), the stencils rock and you know I love Dimensional Magic. 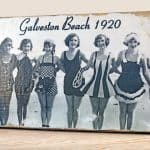 I need to head to Michaels and see if they have any more of these cute little wood shapes, because I have so many more stencils and these are awesome projects to make as gifts. 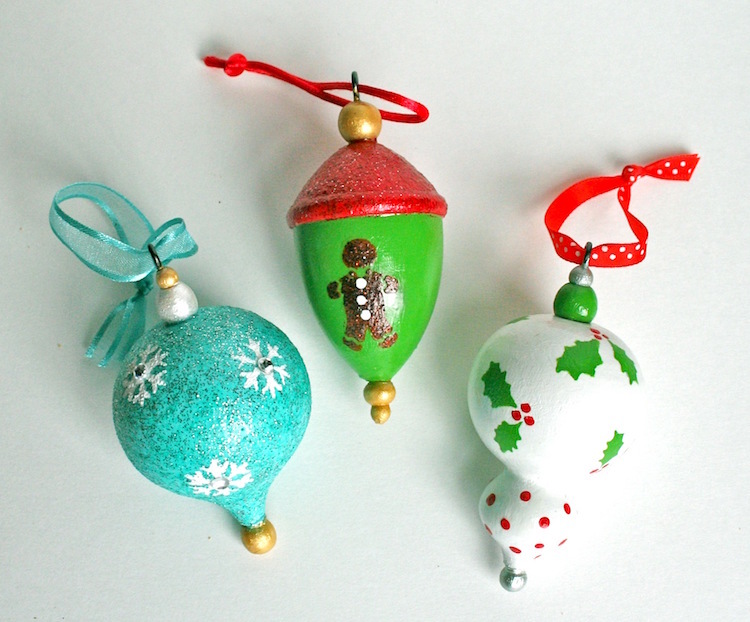 Have you painted any wooden ornaments for Christmas this year? 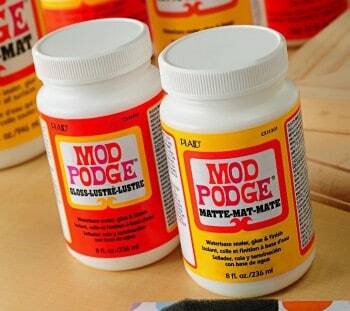 Do you love Mod Podge ornaments? I've got LOTS of ideas for you. Just click on the image below! I’m jealous of your patience! I’m also jealous of your MS paint collection. Oh these turned out super Amy! I am so in love with that glitter paint. Pretty and cute, sparkly is so festive, I love the holiday shine. I haven’t tried Martha Stewart paints yet but would love to. 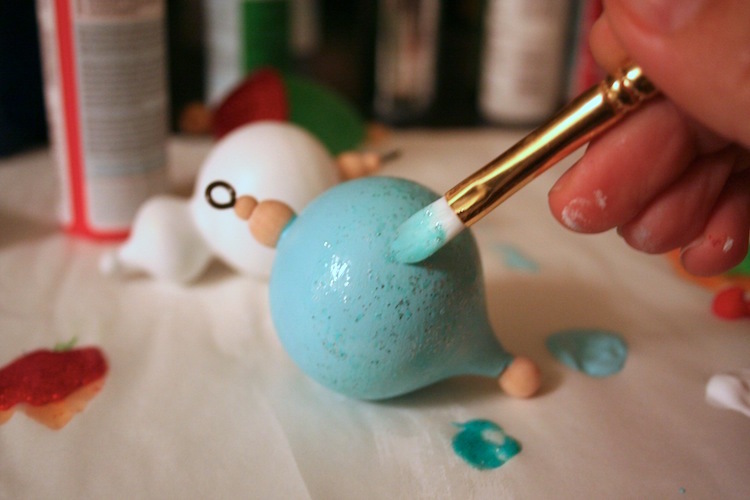 Cute ornaments! 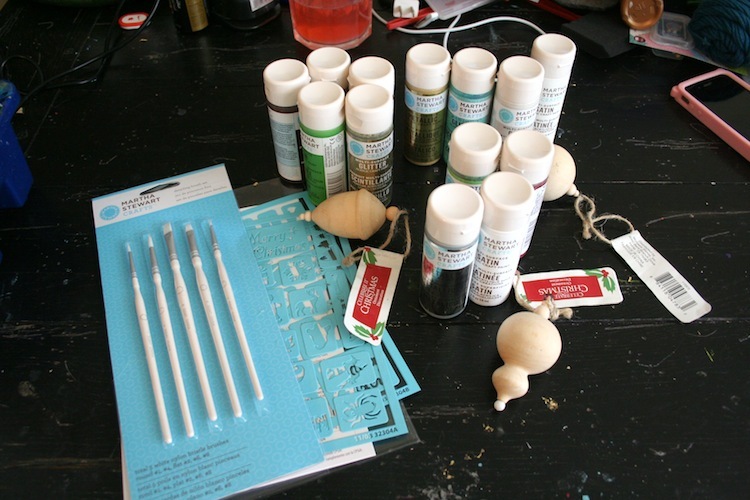 I am ready to get into some holiday crafts now! What would the holidays be without glitter everywhere? I’m in — and hope I win! Thanks for the great offering and super ideas. Super Cute! Three of my favorite holiday things- Snowflakes, Gingerbread and Crafting! I like the glitter paint by itself. I usually use it as a second coat to add a little bling to my project. 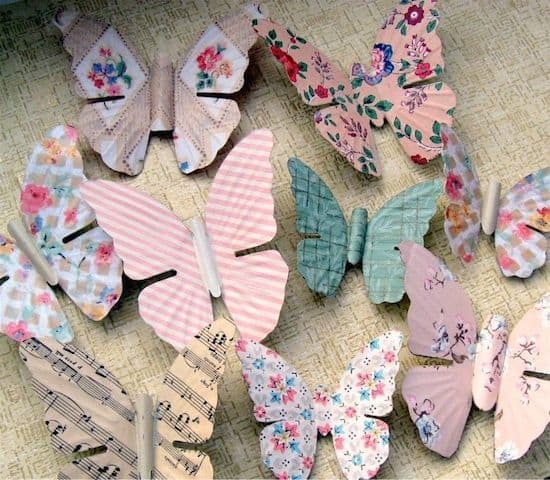 I have two wooden ornaments in my craft drawer that I wasn’t sure what to do with, and now I have a little inspiration! Thank you! So Cute I especially love the blue one. 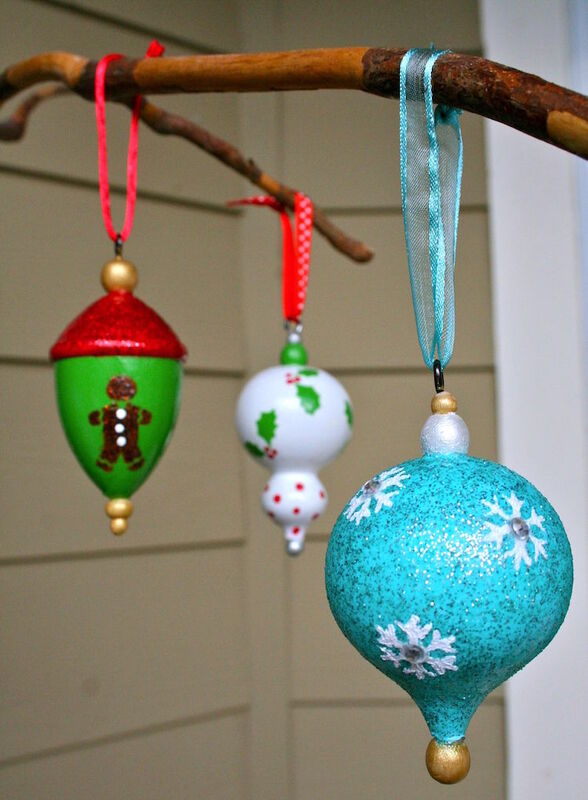 I agree sometimes it takes time to mary objects in order to create something so FAB as these Ornaments! Nice Job, Amy! I always had trouble with the glitter paint..Ah ha! I will pounce it on I love them…so cute! 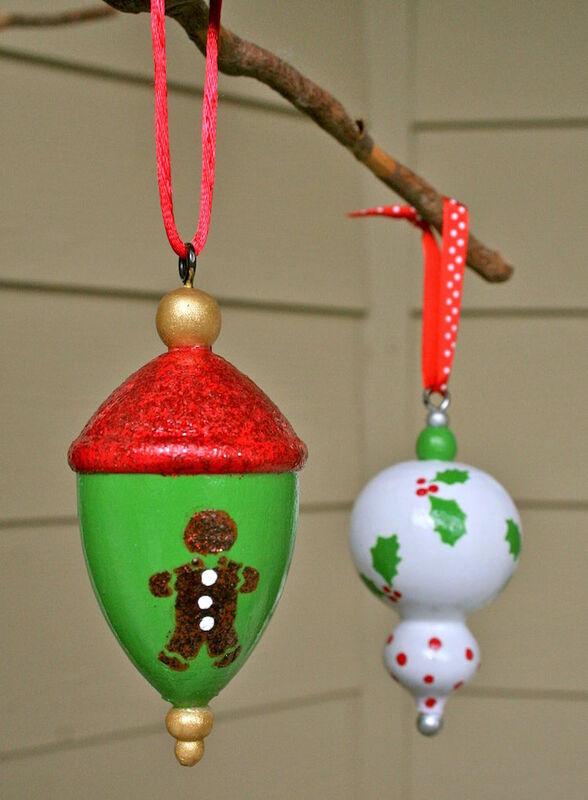 You dressed up those wooden ornaments perfectly! Will have to look out for them at Michaels! Looks like fun and would be great idea as pull for fans a and pull on lights to add as a tossel if they were small.